Muscle biopsy plays an integral role in evaluation of the patient with neuromuscular disease. With some exceptions, it is an essential element in the assessment of a patient with suspected myopathy. In addition, muscle biopsy is also sometimes indicated for the diagnosis of various systemic disorders and the evaluation of suspected neuropathic disease, particularly for the purpose of distinguishing between a neurogenic disorder with an atypical presentation and a primary myopathic disorder. The surgical procedure to obtain a muscle biopsy is relatively simple and poses little risk to the patient. It is, however, a specialized procedure and must be properly performed to optimize the information it can yield for the benefit of the patient. The clinician must first arrive at a rational differential diagnosis by synthesizing information obtained from the clinical history, physical examination, and laboratory and electrodiagnostic studies. This information is used to influence the details of each procedure. The choices of the right time for biopsy, which muscle to select, how many specimens to obtain, and how to handle the specimen immediately following excision are individualized for each patient on the basis of clinical findings. After the biopsy specimen arrives in the pathology laboratory, it undergoes a relatively complex series of procedures and studies. The pathologist uses knowledge of the clinical features to assist in interpretation of the constellation of pathologic findings in the biopsy, as well as to help determine whether additional studies are indicated for a given patient on the basis of the composite of the specific clinical features and biopsy findings. Muscle biopsy therefore is somewhat complex, in that an optimal outcome requires coordination of the clinician, surgical team, pathologist, and technical staff in the pathology laboratory. Because muscle biopsies are often processed and interpreted at specialized centers, it may also be necessary to involve a courier service in the process. A portion of this article serves as a primer on the technical aspects of muscle biopsy, which are critical for the success of the procedure. The aim is to help the reader understand how biopsies should be performed and what happens to the tissue that is obtained, as well as to provide some background information to help nonpathologists understand the pathology reports. An introduction to the clinical features of neuromuscular disease is included in this article (see the section Clinical Features of Neuromuscular Disorders, below) because knowledge of the clinical history is crucial for correct interpretation of the histologic findings in a skeletal muscle sample, most of which are not by themselves specifically diagnostic. Muscle biopsy can sometimes help determine whether a patient has a neurogenic or a myogenic disorder, which is a relatively common issue prompting performance of a biopsy. A brief discussion of peripheral neuropathy, including clinical features and laboratory findings, is included. The general introduction of selected categories of skeletal muscle disease provides information about the classic clinical presentations of several different specific groups of myopathies and how these disorders are diagnosed. It is helpful to compare the structure and histology of normal skeletal muscle (see Skeletal Muscle - Structure and Histology.) with the pathologic alterations observed in muscle (see Skeletal Muscle Pathology.) This knowledge provides a basis for understanding the pathophysiology of some of these disorders, assisting the reader to visualize the effect of disease at the tissue level and providing insight into the process by which histopathologic diagnoses are formulated. When a clinical diagnosis of myopathy is considered, muscle biopsy is often required (for exceptions to this requirement, see the section Myopathies That Might Not Require Muscle Biopsy, below). Muscle biopsy is a fundamental part of the evaluation of a patient with possible muscle disease, also known as myopathy. At present, muscle biopsy is an essential part of the diagnostic investigation of most categories of muscle diseases, including inflammatory myopathies and many metabolic and congenital myopathies and many of the muscular dystrophies. The reason that muscle biopsy is often required for the diagnosis of neuromuscular disease is that there is overlap in the clinical presentations of the disorders and different types of neuromuscular disorders cannot always be confidently distinguished from each other solely on the basis of the clinical features. Repeat muscle biopsy is occasionally indicated for evaluation of the patient with known inflammatory myopathy who, after improvement with steroid therapy, develops increasing weakness. Biopsy findings can help distinguish between recurrence of the inflammatory disorder and steroid myopathy. One common indication for muscle biopsy is to distinguish between myopathy and neuropathy. The classic presentations of these two processes are clearly distinct; however, in practice, the clinical histories and physical and laboratory findings often overlap. Neuropathy and myopathy may also coexist, making a diagnosis based on clinical findings alone particularly difficult or even impossible. Several categories of myopathies do not typically require muscle biopsy for a diagnosis. This section discusses circumstances in which a muscle biopsy is not required for diagnosis of a myopathy. Advances in molecular genetics have eliminated the need for muscle biopsy in most patients with dystrophinopathies and various other muscular dystrophies that have typical clinical presentations by permitting specific diagnosis of these disorders through genetic testing performed on a sample of blood. The reader should be advised that even in the setting of a clinical presentation characteristic of a specific muscular dystrophy in which one might want to omit muscle biopsy and proceed directly to directed genetic testing for a certain dystrophy, it is sometimes necessary to perform a muscle biopsy first to provide histologic evidence of a muscular dystrophy so that insurance coverage for genetic testing can be obtained. In patients with dystrophinopathies, mutations (most commonly deletions) can be demonstrated in the gene for dystrophin, located on the X chromosome (Xp21). This extremely large (2 million base pairs) gene codes for a structural protein of skeletal muscle located on the internal surface of the sarcolemma (muscle plasma membrane). Until relatively recently, its large size precluded searching the entire gene for point mutations; however, dystrophin gene sequencing is now commercially available. Some laboratories first perform testing for the common deletions associated with dystrophinopathies, followed by sequencing of the entire gene if the initial deletion studies are negative. Dystrophinopathies most commonly present in young boys, in the preschool and elementary school age range. Among individuals ultimately diagnosed with a dystrophinopathy, muscle biopsy now is usually performed only in patients with clinical syndromes that differ from typical dystrophinopathies (eg, adults with progressive limb-girdle syndromes). This category includes some women who carry a single X-chromosome with a dystrophin mutation, in whom an unfortunate pattern of random inactivation of X-chromosomes gives rise to clinical myopathy because the number of muscle fibers expressing the mutant dystrophin gene is great enough to produce symptoms. Genetic testing of blood samples is available for abnormalities of genes for other muscle membrane, structural, and myofibrillar-associated proteins that can present as limb-girdle syndromes, such as any of the four sarcoglycans, dysferlin, caveolin-3, calpain, lamin A/C, fukutin-related protein, and, now, many others. Sometimes, muscle biopsy is still performed first to narrow the diagnostic possibilities and to exclude an inflammatory myopathy and is then followed by directed genetic testing. Genetic testing is available for fascioscapulohumeral dystrophy and Perlecan deficiency (Schwartz-Jampel syndrome). Therefore, muscle biopsy, which would demonstrate only nonspecific myopathic findings, is generally not indicated to diagnose these disorders. Myotonic dystrophy type 1 is definitively diagnosed by means of genetic testing on a sample of blood, which reveals a characteristic increase in the number of CTG triplet repeats in the gene for muscle protein kinase on chromosome 19. Myotonic dystrophy type 2 (proximal myotonic myopathy [PROMM]) is due to increased CCTG quadruplet repeats in a zinc finger protein gene on chromosome 3, also detectable by testing on a sample of blood. Athough some of the histopathologic findings on muscle biopsy in these disorders are fairly characteristic, they are not specifically diagnostic; thus, if these disorders are suspected on the basis of the clinical presentation, genetic testing of blood, rather than muscle biopsy, is indicated. Periodic paralyses are uncommon disorders that result from mutations in various genes for muscle membrane ion channels that have unique clinical, biochemical, and electrodiagnostic features. Because they lack specifically diagnostic findings on muscle biopsy, genetic testing is the proper way to confirm the suspected diagnosis of one of these disorders. 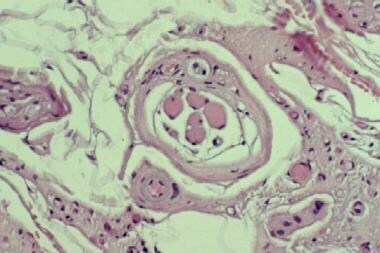 Myopathy can be a feature of disorders of thyroid, parathyroid, and adrenal function. The correct way to diagnose endocrine myopathies is to recognize their clinical presentations and perform serologic testing for appropriate components of the hypothalamic-pituitary–endocrine organ axis. Myotonic dystrophy, periodic paralyses, and endocrine myopathies are not considered further in this article. More information about myotonic dystrophy is available from the Myotonic Dystrophy Organization. Open muscle biopsy is performed with local anesthesia for most adult patients. General anesthesia is typically required for infants and young children. If surgery is performed under local anesthesia, care should be taken not to inject the anesthetic directly into the biopsy site. This minimizes the risk of introducing a track from the needle and the anesthetic into the muscle, which can interfere with interpretation of the biopsy. The local anesthetic should be injected just under the skin in an oval area, whose length is approximately 1.5 times that of the incision. Few findings in a muscle biopsy are pathognomonic for a specific diagnosis. Instead, a typical muscle biopsy sample presents a constellation of findings that must be analyzed in the light of the clinical history in an individual case. To properly assess the significance of histologic findings in a particular muscle biopsy sample, the pathologist must have information about the clinical presentation of a given patient. 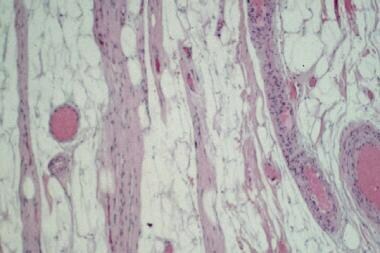 As an example, clear cytoplasmic vacuoles are often present in hematoxylin and eosin (H&E) sections of muscle biopsies. The most common reason for their presence is technical artifact due to ice crystal formation when a tissue sample is frozen, in which case the vacuoles have no diagnostic significance. However, clear vacuoles are also present in many myopathic disorders, including (but not limited to) certain glycogen storage diseases, lipid myopathies, periodic paralyses, and toxic myopathies that can result from treatment with colchicine, chloroquine, or amiodarone. 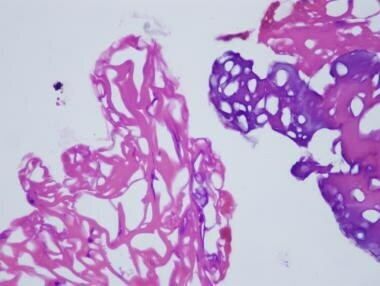 Knowledge of the clinical history allows the pathologist to decide which diagnostic considerations are reasonable in a given case and assists in the determination of whether additional special studies are indicated. For example, in the case of clear vacuoles, if a biopsy shows only a few myofibers with vacuoles, the pathologist must decide whether the vacuoles are insignificant technical effects or whether they are the key diagnostic finding. The clinical history provides guidance for the pathologist in interpreting the significance of the finding. Interpretation of a muscle biopsy is similar to the process of clinical diagnosis, in which one synthesizes all of the information available about an individual patient to arrive at the correct diagnosis for that specific individual. These considerations are addressed more fully in the section Technical Issues in Muscle Biopsy, below. The main clinical hallmark of neuromuscular disease, whether of neurogenic or of myopathic origin, is weakness. Weakness is manifested in age-related variations. For example, weakness in utero can be expressed as decreased fetal movements and may be recognized by a woman who has had previous pregnancies. In the neonatal period, the infant may be hypotonic; this is termed the "floppy infant" syndrome. In later infancy and during the toddler years, delay in acquisition of motor-developmental milestones is typically the major sign of myopathy. From childhood through adulthood, diminished muscle power is a characteristic clinical feature of neuromuscular disease. Variation of strength with activity can occur in some patients with muscle disease. This can mean either decremental or incremental change in strength with a degree of activity that would not result in this change in a healthy individual. Fluctuation of muscle power with activity can suggest a metabolic myopathy. For example, in McArdle disease, myophosphorylase deficiency leads to inability to mobilize glycogen. A patient with this disorder has pain (sometimes cramps) and weakness during the anaerobic phase of exercise. If the patient can exercise at a low level during the anaerobic phase to avoid drawing on glycogen stores, when the aerobic phase of exercise is finally reached and glycogenolysis is no longer needed because free fatty acids can be used for generation of energy, the patient's performance improves. Also, during the aerobic phase of energy metabolism, more energy is produced per unit of glucose metabolized, and therefore less glycogen is needed and less glucose is used to generate more energy than is produced by anaerobic metabolism. Fatigability denotes progressive loss of muscle power with exertion that improves with rest. This is often a defining clinical feature of myasthenia gravis, a disorder of impaired neuromuscular transmission. Muscle biopsy is typically not performed for myasthenia gravis. Myasthenia gravis is usually diagnosed on the basis of the clinical presentation, electrodiagnostic studies showing a decremental response in the muscle with repetitive stimulation of the motor nerve, and the presence of serum antibodies to the acetylcholine receptor or to certain other serum antibodies known to be associated with this disorder. In their conventional clinical presentations, distinguishing muscle disease from peripheral nerve disease is a straightforward matter. In practice, however, this distinction is not always simple. There are several reasons why it may be difficult to determine whether a patient has neuropathy or myopathy on clinical evaluation. One reason is that some myopathies affect distal muscles. Myotonic dystrophy, inclusion body myositis (IBM), some of the myofibrillar myopathies, and distal myopathy of Welander, among others, are examples of myopathies that can affect distal muscle groups. In addition, some neurogenic disorders, including diabetic amyotrophy and motor neuron disease, may affect proximal muscles. Some patients may have combined neurogenic and myopathic disorders. For example, a patient with diabetic neuropathy can also acquire an inflammatory myopathy. A patient who has peripheral neuropathy caused by chemotherapy for cancer may develop dermatomyositis. A patient can have both radiculopathy caused by degenerative joint disease in the vertebral column and a primary myopathy. In these examples, the clinical findings are complicated, which can make it difficult to arrive at a diagnostic category based solely upon the clinical features. A very old but nonetheless superb and well-written monograph by Michael H Brooke, A Clinician's View of Neuromuscular Diseases, provides insight into the clinical evaluation of patients with neuromuscular disease. Although it was written before the explosion of information regarding the molecular genetics of neuromuscular disease, it remains a unique and valuable tool. It is out of print, but copies can still be found for purchase and in libraries. The serum creatine kinase (CK) level is the single most important blood value to obtain when myopathy is being considered. A representative normal reference range from one laboratory is 24-196 IU/L; each laboratory has its own reference range, with the upper limit of normal usually below 200 IU/L. The CK level is useful, but not definitive, in determining whether neuropathy or myopathy is present. Extremely elevated levels of CK (>1500 IU/L) usually indicate muscle disease. Mildly elevated levels (200-800 IU/L) can be observed in either neurogenic or myopathic disorders. Normal levels are not very likely to be found in the patient with myopathy, but patients with myopathy and severely reduced residual muscle mass may have a normal serum CK level. In large patients with substantial muscle mass, CK levels above the normal range in the absence of disease are not uncommon. The serum aldolase level can be helpful in providing evidence of myopathy. Because of its longer half-life in serum, the serum aldolase level is sometimes elevated in the setting of myopathy when the CK level is normal. If the CK level is known to be abnormal, there is no reason to obtain testing for the aldolase level. Electrodiagnostic studies are often extremely useful in determining whether a neuropathic, myopathic, or mixed disorder is present. Changes in nerve conduction velocities, the compound muscle-action potential, or both can be present in neurogenic disorders. Electromyography (EMG) shows different findings in neurogenic and myopathic disorders and can be useful to help distinguish them; specific details are beyond the scope of this chapter. Avoiding EMG in a muscle that will undergo biopsy is of critical importance. EMG inflicts damage on the muscle that can interfere with proper interpretation of a biopsy for 1-2 months. In patients with suspected myopathy, needle EMG should be performed on muscles on only one side of the body; a subsequent muscle biopsy should be performed on the other side. Biopsy of a clinically involved muscle is important. Most disorders preferentially or more severely affect certain muscles while relatively or completely sparing other muscles. Some disease processes have a patchy distribution rather than being diffusely distributed in the affected muscles. To increase the likelihood of sampling the pathologic process, selecting a symptomatic muscle is important. Selection of a muscle should be based on the expected distribution of the leading clinical diagnosis. For example, if the leading diagnostic consideration is polymyositis, a proximal muscle, such as the vastus lateralis of the quadriceps, is the best choice for biopsy. When possible, biopsy should be performed on a muscle that is not too weak and atrophic (see the first image below), because this may result in obtaining a sample of end-stage muscle. In end-stage muscle, loss of myofibers is severe, and the myofibers are replaced by fibrovascular and adipose tissue without residual clues to the process that caused the muscle damage. On occasion, only the presence of a muscle spindle confirms that the specimen is a biopsy sample of skeletal muscle (see the second image below). Hematoxylin-eosin (H&E) paraffin section of muscle biopsy sample reveals end-stage muscle. Fibrovascular and adipose tissue have entirely replaced muscle, which can therefore impart no information about patient's underlying pathologic process. Hematoxylin-eosin (H&E) paraffin section of muscle biopsy sample revealing end-stage muscle. Structure in center of image, consisting of cluster of small muscle fibers surrounded by capsule, is muscle spindle; this finding confirms that specimen is indeed skeletal muscle. In performing a muscle biopsy, it is essential to cause as little trauma to the muscle tissue as possible so as to reduce the risk of disrupting the muscle architecture and minimize the risk of introducing contraction band artifact and other technical artifacts. Electrocautery should not be used to obtain a specimen for muscle biopsy. The images below demonstrate effects of the application of electrocautery to skeletal muscle muscle during biopsy. The first shows an area of tissue coagulation that results from application of electrocautery, and the second shows severe contraction band artifact that is caused by the electric current; both of these technical effects interfere with interpretation of a muscle biopsy, particularly if they are widespread. Electrocautery can also cause lack of staining of myofibers with the stains that are performed on cryostat (frozen) sections of muscle, particularly the enzyme histochemical stains that are frequently performed on muscle biopsies (not shown). Hematoxylin and eosin paraffin section of a region of a skeletal muscle sample coagulated by the application of electrocautery to the tissue during the biopsy procedure. The tissue is unrecognizable. Hematoxylin and eosin paraffin section shows severe contraction band artifact in the myofibers in this area of a muscle biopsy, which is the result of application of electrocautery. 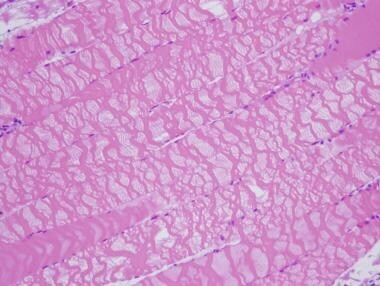 This area of the sample is not coagulated, as seen in the previous image of this case, above, so it can be recognized as skeletal muscle, but there is severe disruption of the architecture of the affected myofibers, which can significantly interfere with interpretation of a muscle biopsy. The specimens required and the details of the preferred method of biopsy handling vary among medical centers and commercial laboratories that process muscle biopsies. It is essential to consult the center that will receive the biopsy sample so as to learn the requirements and the preferred method of handling and shipping the tissue. The surgeon must ultimately determine the precise surgical method for each patient. The information below should be considered a general guide. These considerations should be tailored to meet the needs of the individual patient and institution. The typical muscle biopsy sample consists of two specimens: fresh and fixed. In certain special clinical circumstances, a third sample for biochemical analysis may contribute to the specific diagnosis. Today, the most common use of this third special sample of muscle is for assay of the activities of mitochondrial enzymes; this assay is performed by only a limited number of laboratories and is indicated in only select clinical circumstances. On occasion, a muscle biopsy sample consists only of a single fresh specimen, usually in the form of multiple minute fragments, obtained by means of needle biopsy. In one center, with a strong research program in muscle disease, a strong motivation to perfect the technique, and physicians experienced with the procedure, needle biopsy is the preferred method of muscle biopsy, with a diagnostic yield comparable to open biopsy  ; however, a full open biopsy is preferred by most medical centers and laboratories that process muscle biopsies. Occasional laboratories simply do not have the level of technical expertise required to adequately process and section tiny needle biopsies. A fresh specimen (see the image below) is used for histochemical studies and certain immunohistochemistry studies that are optimized for cryostat sections and is sometimes used for immunofluorescence in selected patients, when indicated, by laboratories that are set up to perform immunofluorescence. The fresh specimen should measure approximately 0.5 × 0.5 cm in cross-section, or 0.5 cm in diameter, and 1 cm in length along the longitudinal axis of the muscle fibers. Fresh specimen is mounted on cork by using gum tragacanth. It is poised above vial of isopentane, which is chilled with liquid nitrogen coolant. Specimen is frozen by gently immersing it in isopentane. In this photograph, fibers are oriented longitudinally in vertical plane. Tissue is sectioned by using cryostat for cross-sections. The sample can be sent to the laboratory on saline-moistened gauze in a sealed container on ice; in this way, it is kept cold without becoming frozen. The tissue should not be immersed (ie, should not be floating or drenched) in sodium chloride solution, because this will lead to the formation of ice crystals in the myofibers when the sample is frozen. Some laboratories use specific transport media for the fresh specimens. When the specimen arrives in the laboratory, the technologist mounts it in gum tragacanth (or another mounting medium) in the appropriate orientation and snap-freezes it in isopentane chilled in liquid nitrogen. Frozen sections are cut from this sample by using a cryostat. The terms frozen sections and cryostat sections are used interchangeably. Optimally, after the biopsy procedure, this fresh specimen is immediately transported to the laboratory for processing to prevent the tissue from losing any of its enzymatic reactivity (needed for histochemical studies) or immunogenicity (needed for immunohistochemical studies). In most situations, however, the sample remains in satisfactory condition for most necessary studies if refrigerated overnight or even if refrigerated for a few days in the event of an unavoidable delay (though a delay of longer than overnight is definitely not recommended). A fixed specimen (see the image below) is used for routine microscopy and possible electron microscopy (EM). EM is reserved for special situations in which it is expected to substantially contribute to the diagnosis. The fixed specimen should have dimensions similar to those of the fresh specimen. It must be handled properly to maintain orientation of the fibers, to keep the fibers at rest length, and to prevent contraction. Specimen of skeletal muscle on 10-mm Rayport clamp is fixed in paraformaldehyde. Longitudinal axis of fibers is oriented in horizontal plane. Small piece of muscle that is not clamped lies obliquely over clamped portion of specimen. The sample is optimally removed from the patient by using a special clamp designed for this purpose, such as the 10-mm Rayport clamp (V. Mueller, McGaw Park, IL; see the image above). There are other muscle clamps that may be preferred by some surgeons or laboratories. A segment of muscle of the desired dimensions is dissected. The bottom portion of the clamp is inserted below this segment of muscle in the posts-up position so that the length of the fibers runs perpendicular to the jaws of the clamp. After the bottom portion of the clamp is inserted, the top portion of the Rayport clamp can be folded over and the holes fitted onto the bottom posts. The surgeon then excises the muscle fibers 1-2 mm external to the clamp. The specimen is placed in fixative. The preferred fixative in some laboratories is 4% paraformaldehyde. If a special clamp is not available for the procedure, alternative methods of obtaining the fixed specimen are available. The sample can be sent as a fresh specimen to the laboratory, where the technologists perform the procedures needed for immobilization and fixation. Another method involves suturing or pinning the specimen to a tongue blade or a piece of cork for immobilization prior to fixation. If paraformaldehyde is not available, 10% neutral buffered formalin is an acceptable alternative for most light-microscopic purposes. If, however, EM is desired, the specimen initially fixed in paraformaldehyde has better ultrastructural preservation than that of a sample fixed in formalin. If paraformaldehyde is not available and it is anticipated that EM will be needed, a small portion of muscle can be placed directly in 3% glutaraldehyde at the time of biopsy for submission to the EM laboratory. To prevent contraction of the muscle, the sample should be maintained at rest length before it is immersed in the fixative. The specimen to be immersed must be small (1-2 mm wide or deep) because glutaraldehyde penetrates tissue slowly. If it is too large, portions of the sample will not be adequately fixed for EM before they become degraded. After overnight fixation in paraformaldehyde, the technologist separates a small section and submits it in glutaraldehyde for embedment for EM. The remainder is submitted for paraffin processing, with the end of the specimen removed and placed in cross-section and most of the specimen submitted in longitudinal section. An additional fresh specimen is useful in selected cases where the presence of a metabolic myopathy, particularly a mitochondrial disorder, is strongly suspected. The sample may be sent to specialized laboratories for assessment of specific enzymatic activities (eg, mitochondrial enzymes). Such a sample can be used for measurement of specific protein constituents in muscle (eg, the protein dystrophin), but in most cases, the availability of genetic testing on a sample of blood has made Western blot analysis of muscle proteins unnecessary, and this type of study is not usually done today. This specimen should be of dimensions similar to those of the other specimens, and optimally, it should be snap-frozen in liquid nitrogen at the location of the procedure because of the lability of some of these cellular constituents. It should be stored in a freezer at –70°C. Laboratory personnel should be alerted in advance if the need for this type of specimen is anticipated. Many medical centers are not equipped to perform this service. This extra sample can also be immediately frozen by using dry ice if liquid nitrogen is not available. 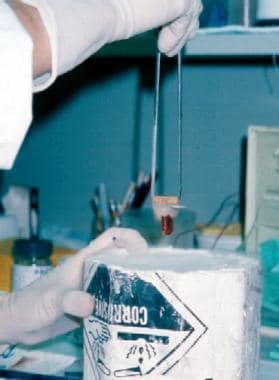 Care should be taken to insulate this sample from the rest of the biopsy when the specimen is being transported to the laboratory, so that the other parts of the biopsy do not become frozen. For examples of these studies in normal skeletal muscle, see Skeletal Muscle - Structure and Histology; for examples of these studies in various neuromuscular disorders, see Skeletal Muscle Pathology. The actual methods for performing the stains can be found in standard histology textbooks and pathology laboratory manuals. Immunohistochemical stains must be performed by a laboratory set up for this purpose. The manufacturer provides instructions for use of each individual antibody, and each laboratory develops its own modifications to achieve optimal results with the stains. At Stony Brook Medicine, for every muscle biopsy, a battery of stains is performed on the frozen sample in addition to the routine H&E stain. These routine stains assist in screening for and assessing neurogenic or other types of atrophy and metabolic diseases, as well as demonstrating structural changes or inclusions diagnostic of specific disorders. Some of these studies cannot be performed on material that has been fixed and embedded in paraffin. Some of the structures and materials are dissolved by paraffin processing, so they can only be identified in frozen sections. After review of the initial battery of stains, if the clinical and pathologic findings warrant, the pathologist may decide to perform additional special stains. H&E is the routine histologic stain used for evaluation of basic tissue organization and cellular structure. With nicotinamide adenine dinucleotide tetrazolium reductase (NADH) staining, the activity of this group of enzymes is demonstrated by the transfer of hydrogen to a compound that turns gray-blue when it is reduced. These enzymes are found in mitochondria and endoplasmic reticulum. This stain is used to assist in evaluating for neurogenic atrophy, mitochondrial disorders, and central core disease, among others, and it is useful for detecting subtle alterations of intracellular structure in a myofiber that suggest it is not well. Fiber-typing stains are also used. Muscle is composed of two main myofiber types: 1 and 2. Some disease processes characteristically affect one type or the other, resulting in atrophy of either type 1 or 2 myofibers. Other processes, such as neurogenic disorders, can alter the distribution of both types. Many laboratories use a myosin adenosine triphosphatase (ATPase) stain at multiple pH levels to demonstrate the different fiber types. This is a difficult, labor-intensive stain to perform. An immunohistochemical stain for the different myosin heavy chains found in type 1 and type 2 myofibers is an alternative method for demonstrating the two types of myofiber. These stains are adequate for myofiber typing in most cases. Novocastra (Newcastle upon Tyne, England) recommends an immunohistochemical stain for research purposes only. Immunohistochemical stains are now available for different forms of myosin ATPase. The modified Gomori trichrome stain is particularly helpful in evaluating for the presence of mitochondrial disorders, inclusion body myositis, and nemaline myopathy, among many other uses. Periodic acid–Schiff (PAS) stains glycogen and other polysaccharides. It is most useful for the diagnosis of glycogen storage diseases. PAS also stains the basal lamina of vessel walls, so it can be useful for evaluating the structure of vessels. Fat stains, including Sudan Black, oil-red-O, and osmium, are used to demonstrate the presence of neutral lipids in muscle, which are normally present but can exist in abnormal amounts or distribution in carnitine deficiency, some mitochondrial disorders, acquired metabolic disorders (eg, in starvation), and nonspecific abnormalities of the myofibers. Human leukocyte antigen (HLA) class ABC by immunohistochemistry is used to identify and support the diagnosis of autoimmune or inflammatory myopathies. Other terms for HLA class ABC are HLA class I and major histocompatibility complex (MHC) class I.
Paraffin sections are usually stained with H&E. This specimen consists of a fairly large surface of myofibers (muscle cells) oriented in the longitudinal direction and a piece in cross-section. A relatively large amount of tissue is usually exposed in each paraffin section; therefore, this specimen is extremely useful for evaluating for processes with a nonuniform distribution (eg, inflammatory myopathies, vasculitis). Because the fixed and paraffin-embedded specimen maintains more cytologic detail than the frozen specimen does, it is the preferred sample for detecting subtle evidence of myofiber necrosis, determining the type of inflammatory infiltrate present, and examining the structure of blood-vessel walls. Although a small sample of every muscle biopsy should be set aside for possible EM, performing EM on muscle biopsy samples is not a routine procedure; rather, it is reserved for selected circumstances in which the pathologist determines that EM has the potential of contributing significantly to determining a specific diagnosis. The pathologist uses knowledge of the clinical history and findings of light microscopic studies to decide if EM is indicated. EM is costly and time-consuming and requires a specialized laboratory and technical expertise. Some technical aspects of EM are described below. If the specimen is fixed in paraformaldehyde, it is transferred to 3% glutaraldehyde after sufficient time has passed for the paraformaldehyde to penetrate the tissue. The length of time required for this process depends on the size of the specimen, but overnight fixation is more than satisfactory for the purpose. Glutaraldehyde may provide a bit more cross-linking of the membranes, which is needed for EM. If paraformaldehyde is not available, the tissue, held at rest length by pinning to cork, can be placed directly in glutaraldehyde. Because glutaraldehyde does not penetrate the tissue as well as paraformaldehyde does, a specimen placed in glutaraldehyde must be small, approximately 1-2 mm in width and depth. Glutaraldehyde makes tissue brittle and interferes with immunohistochemical studies; thus, it is not appropriate for the paraffin specimen. If the tissue is fixed in formalin, it is not as well preserved for EM as it would be with paraformaldehyde or glutaraldehyde. Performing EM on tissue fixed only in formalin is possible, but this is suboptimal. Cutting tissue out of a paraffin block or removing it from a slide for EM is possible, but the likelihood of obtaining useful results with these methods is limited. After fixation, the tissue is divided into samples of 1 mm3, postfixed with osmium tetroxide, and embedded in epoxy resin. Samples are oriented in either a longitudinal or a transverse direction before polymerization of the resin. The process of embedment requires 2 days. Survey sections for light microscopy with a thickness of 1 μm, termed semithin (or thick) sections, are cut from the material embedded in plastic and stained with either toluidine blue or methylene blue-azure II. The pathologist reviews these sections, and areas of interest are chosen for EM. An ultramicrotome with a diamond knife is used to cut thin sections for ultrastructural study. These then are stained with uranyl acetate and lead citrate. They are placed in an electron microscope and examined. Repeat muscle biopsy is occasionally indicated to evaluate the patient with known inflammatory myopathy who, after improvement with steroid therapy, has increasing weakness. Biopsy findings can help distinguish between exacerbation or recurrence of the disorder and steroid myopathy. Unsuitable, suboptimal, or inadequate biopsy specimens can usually be attributed to lack of planning and forethought, a lack for which there is no excuse. The single most important task to remember when one is contemplating muscle biopsy is to call the pathology laboratory in advance for advice on how to proceed. The specimens required and the preferred method of handling vary among medical centers. Consulting the center that will receive the biopsy sample is essential for learning the exact requirements and the preferred method of handling and shipping the tissue. Few true contraindications to muscle biopsy are noted. This procedure is contraindicated in someone with a high risk of intractable bleeding from the procedure or with an obvious infection at the planned biopsy site. The surgical procedure to obtain a muscle biopsy is relatively simple and poses little risk to the patient in the absence of an underlying bleeding or clotting disorder. Cox S, Limaye V, Hill C, Blumbergs P, Roberts-Thomson P. Idiopathic inflammatory myopathies: diagnostic criteria, classification and epidemiological features. Int J Rheum Dis. 2010 May. 13(2):117-24. [Medline]. Dimachkie MM, Barohn RJ, Amato AA. Idiopathic inflammatory myopathies. Neurol Clin. 2014 Aug. 32 (3):595-628, vii. [Medline]. Vogel H, Zamecnik J. Diagnostic immunohistology of muscle diseases. J Neuropathol Exp Neurol. 2005 Mar. 64(3):181-93. [Medline]. Darras BT, Royden Jones Jr H, Ryan MM, De Vivo DC, eds. Neuromuscular Disorders of Infancy, Childhood, and Adolescence: A Clinician's Approach. 2nd ed. London: Elsevier Academic Press; 2015. [Guideline] Narayanaswami P, Weiss M, Selcen D, David W, Raynor E, Carter G, et al. Evidence-based guideline summary: diagnosis and treatment of limb-girdle and distal dystrophies: report of the guideline development subcommittee of the American Academy of Neurology and the practice issues review panel of the American Association of Neuromuscular & Electrodiagnostic Medicine. Neurology. 2014 Oct 14. 83(16):1453-63. [Medline]. [Full Text]. Amato AA, Russell JA. Neuromuscular Disorders. 2nd ed. New York: McGraw-Hill Education; 2016. Brooke MH. A Clinician's View of Neuromuscular Diseases. Baltimore: Lippincott Williams & Wilkins; 1986. 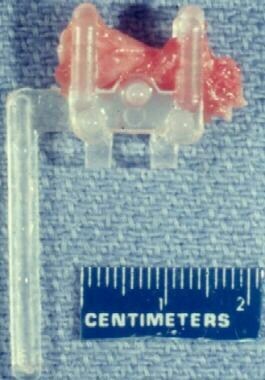 Tarnopolsky MA, Pearce E, Smith K, Lach B. Suction-modified Bergström muscle biopsy technique: Experience with 13,500 procedures. Muscle Nerve. 2011 May. 43(5):716-25. [Medline]. I would like to thank all of the clinicians and surgeons who allow me to share in the care of their patients with neuromuscular disorders; Karin Thompson and the other technologists whose conscientiousness and expertise in handling and processing the biopsies are essential to the successful evaluation of the patients; and Dr Nancy Peress, who generously devoted years of her life to training me in neuropathology and subsequently working with me as a treasured colleague, mentor, and friend.